Hakuno Kishinami is the protagonist of Fate/Extra and Fate/Extra CCC, acting as the Master of Saber, Archer, Caster, or Gilgamesh depending on which is chosen. The character is male or female depending on player preference, and their name and a nickname can be selected as well. 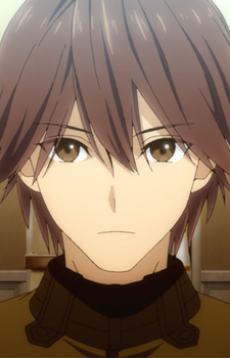 The male protagonist has brown hair and eyes and wears the standard male school uniform of Tsukumihara Academy, and wears a black t-shirt beneath his jacket. In Fate/Extra Last Encore, Hakuno is an existence brought about after Twice H. Pieceman decided that it was worthless to try to guide humanity's path, ceasing the Moon Holy Grail War and shutting down the Moon Cell's systems. The Moon Cell normally allowed for the emotions of those who die to be set free, but the closing of the Angelica Cage changed that process. As regrets of the deceased were no longer disassembled and purified, they began to congregate, and the regrets of the many "victors", people who were slain by Twice upon reaching the Angelica Cage, caused a new existence to awaken to bear the burden of their grudges. Hakuno became a "mass of death" in the shape of female Hakuno Kishinami's components.